Dealing with aging parents is one of the greatest challenges for adults as they reach their 40s and beyond. The people who once stood out as heroes that could do no wrong have become dependent on others. I’m not speaking from direct personal experience, but I’ve noticed the challenges with my grandparents during the past few years. When you add the weight of difficult memories from younger days, it makes this process even trickier. 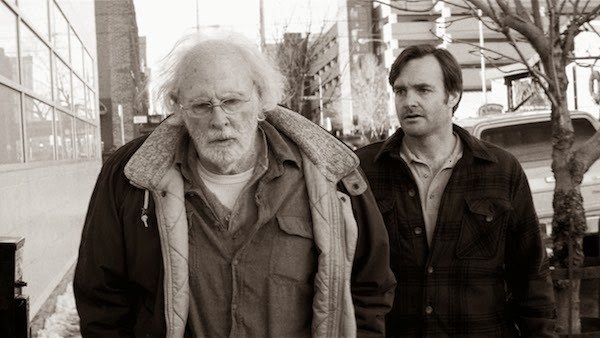 Alexander Payne’s Nebraska masks the barriers of a father-son relationship within the context of a road movie. It’s a comedy that tackles the nuances of small-town culture, but the heart is the tough relationship of two guys with a failure to communicate. Their family connection binds them together, yet finding common ground is nearly impossible. 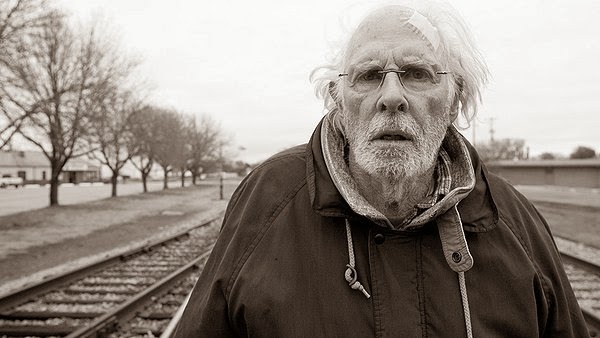 Bruce Dern’s Woody Grant is a broken-down guy obsessed with getting his million dollars. All it takes is a trip to Lincoln, Nebraska. Of course, there’s nothing at the end of the rainbow. It’s just a way to get people to buy magazines. Logic and rational explanations won’t deter this grizzled dreamer, and he’ll walk down the highway if that’s the only way to get there. Given the distance from Billings, Montana to Lincoln, his son David (Will Forte) decides it’s wiser to just indulge this fantasy and drive his father to Nebraska. A detour takes them to Woody’s hometown of Hawthorne, Nebraska and provides surprising details on his past. The townsfolk are also interested in Woody’s impending riches. A question hanging over Woody’s actions is whether he’s experiencing dementia. He often seems confused and acts in the face of reality. Writer Bob Nelson’s screenplay doesn’t make that case, but there are hints that Woody is missing some of his faculties. Another possible reason is that he never recovered from his experiences in the Korean War. He’s been drinking heavily since his return, and that’s harmed his brain. Regardless of the reasons, Woody is child-like in his insistence in going to Lincoln. He makes several visits to the hospital yet keeps venturing forward. Is his quest admirable or just pure lunacy? While the latter seems more likely, there is something noble in that persistent need to finish the mission. Life hasn’t been easy for the well-meaning guy, and people have taken advantage of his generosity. Is it too much to let him finish a harmless journey? Alexander Payne thrives in this type of setting and finds humor within the nuances of small-town life. There have been criticisms that he’s setting up these characters for ridicule, but that’s too simple an interpretation. 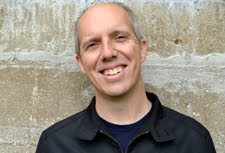 There are a wide range of personalities in Hawthorne, from the two brothers obsessed with cars to Woody’s scheming former business partner Ed Pegram (Stacy Keech). Payne gets laughs from scenes like the nearly silent watching of a Bears game by a group of stoic men. It seems outlandish, yet I’ ve met relatives that aren’t that much different. This town is a heightened version of reality. Payne and Nelson walk a fine line between light comedy and ridicule, but it never reaches that point. Dern was nominated for an Oscar, and he deserves the acclaim for making Woody such a well-defined character. We never have any doubts that he’s authentic and grow frustrated with him right along with David. I’ve yet to mention June Squibb, who also received a nod and brings fire to the tricky role of Woody’s wife Kate. She gets one big speech to the manipulative townspeople and doesn’t waste it. The story really picks up when she arrives and becomes about more than Woody and David. Squibb’s role could have easily become the typical “outspoken old lady” part, yet there’s warmth to Kate that helps her to avoid that type. Payne doesn’t hate his characters, and that’s the main reason it works. Woody is a mess, yet we still feel for the guy because he isn’t a caricature. 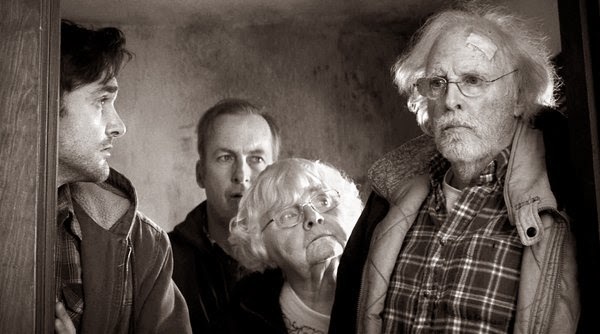 This heart gives Nebraska the added layer that takes it beyond a predictable slice of life. Despite their challenges, we want to learn more about the characters and discover what’s led them into such an unfortunate cycle. David has a decent job and is a solid guy, but he isn’t grabbing life by the horns. His girlfriend leaves him because he’s running in place, and it’s that type of morass that Woody’s fighting against with his trip. This cycle is evident in Hawthorne, where a rough economy has decimated the town. These characters are struggling with more than just personal issues; they’ve lost the American dream. Few signs exist that it’s coming back anytime soon, so all we can do is make the best of what’s possible. Great review Dan! I was so pleasantly surprised how much I enjoyed this, it even ended up on my top 10 of 2013. "Woody is a mess, yet we still feel for the guy because he isn’t a caricature." Exactly! I think his authenticity makes me like him despite his flaws, his quirks and grumpy attitude is actually pretty endearing to me. Ruth, there's a certain side of Woody that's endearing, particularly when you start to learn more about the people in town. 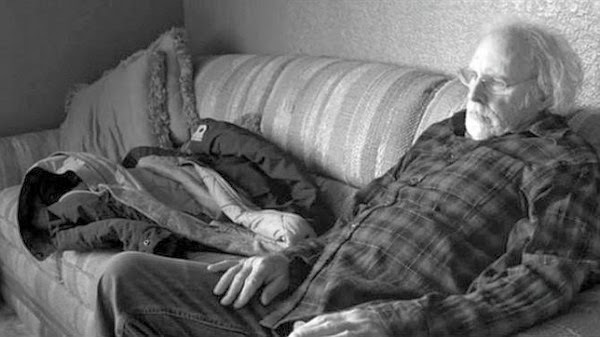 I expected to like Nebraska because of Alexander Payne, and I wasn't disappointed. Wonderful review! Nebraska is one of those movies that had to grow on me but the more I think and talk about it with other people, the more I appreciate it. By the way, some friends of mine once went to a supermarket and met a guy just like Woody, who was asking for his million Euro, haha. I totally agree. I gave it 3.5/5 on Letterboxd right after watching it, but my feelings grew a little in the few days before I finished the review. Writing about it brought out some added layers for me. I'm sure there are quite a lot of people like Woody; fun story! Thanks Courtney! I didn't talk about the use of black and white in my review, but you're definitely right that it's a good choice. It creates a sense of melancholy and nostalgia yet shows things were pretty terrible in his past. Nice point about Squibb's Kate not just being a nasty old lady. There's definitely a lot of love under her prickly exterior. Definitely. Even though Woody drives her crazy, she's still really protective of the guy and recognizes how easily he can fall into the traps set by people without his best interests at heart. Good review Dan. We've all seen Payne do this kind of story before, and while it may not be perfect this time around, it's still pleasant enough and worth watching. I did see similarities between this and some of his other work, especially About Schmidt and a little bit of Sideways with the road movie. Still, this felt a bit different. I think not writing the script was part of it. Nice review, Dan! I didn't like it as much as other Payne films, but I appreaciate what he was going for, looking at life in small town American, and the performances are top-notch. Good observation, that the audience kind of grows frustrated with Woody, right along with David. It's been a long time since I've seen About Schmidt and Sideways, so it's hard to compare. It does fall behind The Descendants and Election for me, at least. Still, there's a lot to like, particularly with the acting like you say.